It is an incredible thing when the heart knows exactly what it wants. For Dorothy Gervasio, her heart was speaking to her loud and clear when it came to what she wanted. 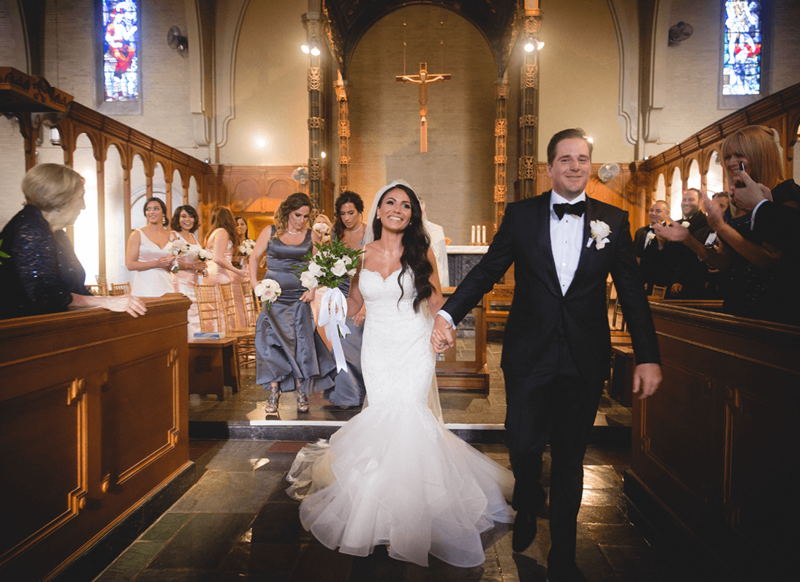 Dorothy and her heart said “I do” to Michael Gervasio on July 15, 2017 at the Aldridge Mansion in Warwick, Rhode Island in an enchanting gown that her heart had just as easily said yes to. Wedding gown shopping for Dorothy was a breeze. 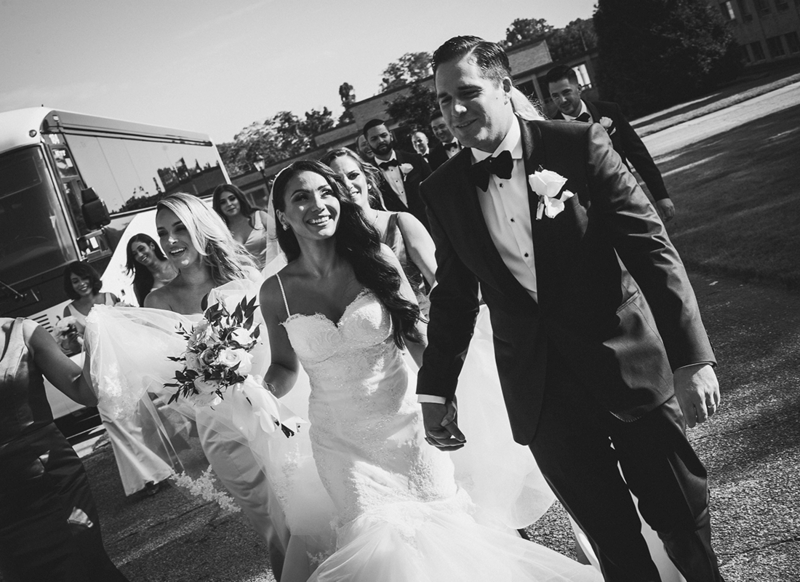 For her it was a no brainer to go to the Pnina Tornai Boutique at Kleinfeld Bridal in search of her dream gown. Therefore, a year before her wedding, Dorothy made the trip to the impressive bridal salon with her mom, sister, and best friend to shop for her ideal wedding dress. The trip did not take long though because upon trying on her second gown ever, Dorothy knew she had found the one. “I cried when I saw myself in the gown which I didn’t think I would do,” Dorothy recalls about the moment she knew this gown was it. 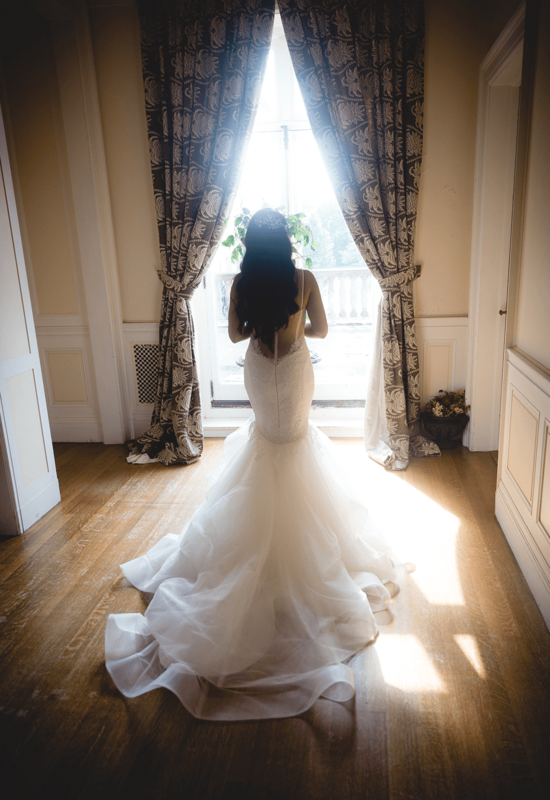 Unlike many brides who continue trying on gowns in disbelief that they have already found the one, Dorothy listened to her heart and stopped immediately after trying on her dream gown. When you know, you know and Dorothy knew that this was the gown that she would wed the love of her life in. Dorothy had fallen in love with a lace embroidered mermaid gown with an organza train and tennis bracelet straps. As an added bonus to finding the perfect wedding dress, Dorothy also got to meet the designer of her chosen gown, Pnina Tornai. The designer herself took the brides measurements and made sure that the gown was exactly to Dorothy’s liking. After agreeing to add more lace to the back of the gown to cover a few of Dorothy’s tattoos, Dorothy’s gown was now complete. 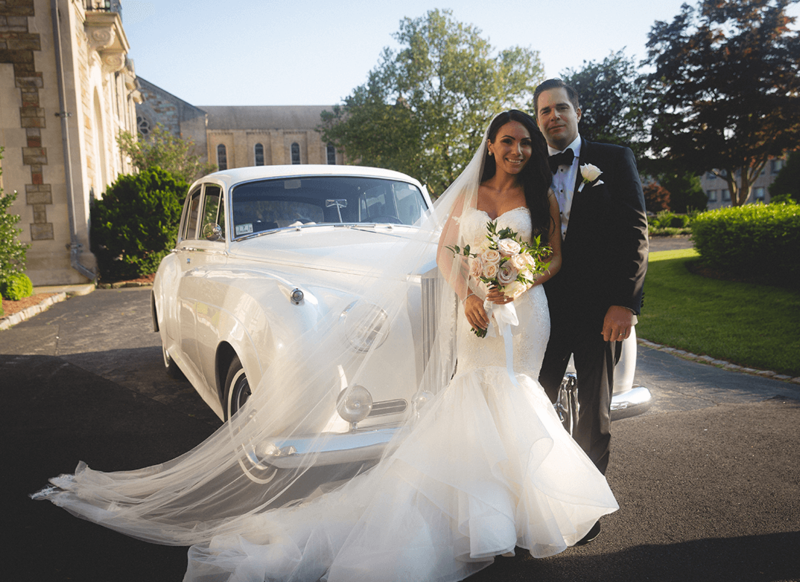 To compliment her exquisite gown, Dorothy also purchased a cathedral length Pnina Tornai veil. It flowed beautifully over the train of her wedding dress and was embroidered with the same lace that adorned her gown. 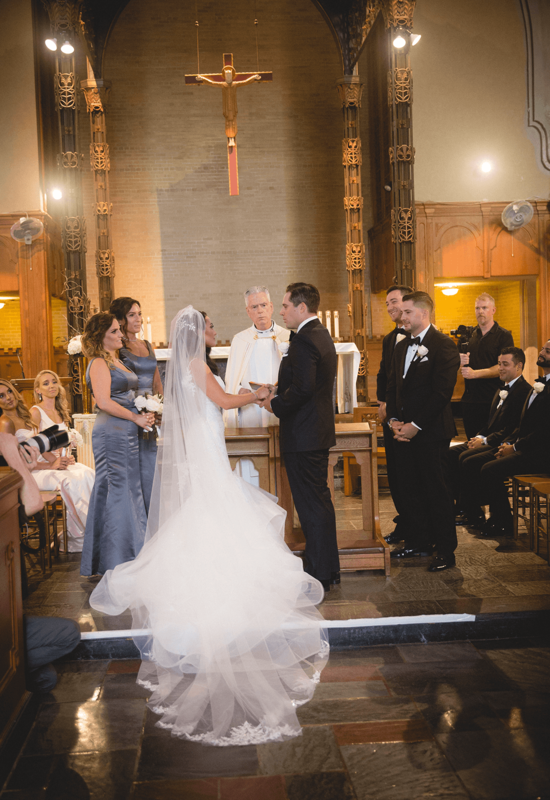 The veil was everything that Dorothy had ever wanted and more because she had always envisioned herself walking down the aisle in a long and dramatic veil. The jewelry was kept to a minimum to keep the focus on Dorothy and the gown. Dorothy chose to wear stud earrings and a small bracelet. To finish the look, Dorothy had her hair in luxurious, cascading curls for her wedding day. 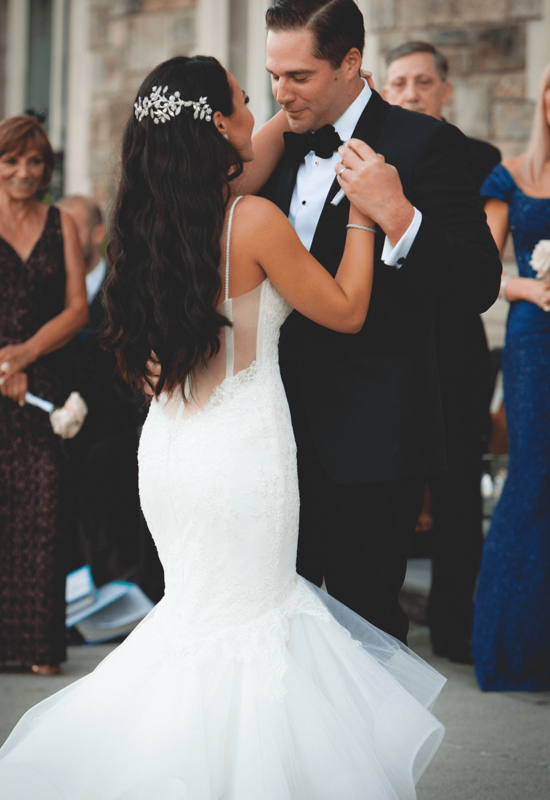 In her hair was a stunning crystal headpiece that she had also purchased from Kleinfeld Bridal. Everything was coming together in exactly the manner Dorothy had hoped. The gown fit the upscale and classic ambience that Dorothy had wanted for her wedding. With her bridesmaids in pink and grey beside her and surrounded by dreamy white and gold floral decorations, Dorothy’s heart was filled with happiness and joy on her special day. To top it all off, the gown she had chosen was nothing short of spectacular. 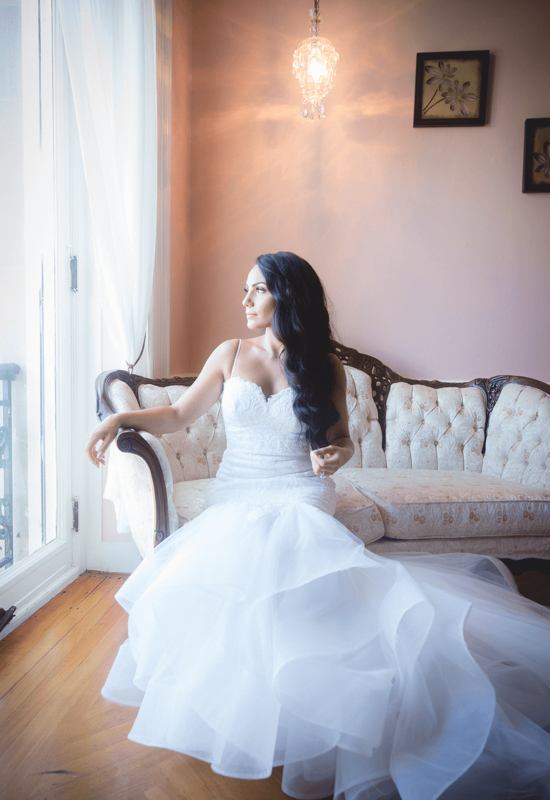 Dorothy had listened to heart throughout the entire wedding process and when it was her wedding day, her heart’s desires became a beautiful reality. In her ethereal and mesmerizing gown, Dorothy said her I do’s, ready for this new and magical chapter in life and in love.